Our tour of Germany continues this week and we're moving to the other end of the size spectrum by taking a look at the flag of Germany's smallest state- The Free Hanseatic City of Bremen. So before we plunge into what's up with this cool looking flag, we've got to take a slight historical detour to talk about the Hanseatic League, since it's sort of relevant here. Basically, the Hanseatic League sort of emerged as a commercial and defensive confederation of Northern German cities in the 1100s and rose to be the chief commercial power in the Baltic for nearly three centuries before declining in the middle 1400s and petering out by 1669, when only nine members attended the last formal meeting of the League. Three cities remained as members until it's final demise in 1862 and those are the three cities that retain 'Hanseatic City' in their official titles: Lubeck, Hamburg and of course, Bremen. The League has modern legacies in the German airline Lufthansa, F.C. Hansa Rostock and the Hansa Brewery in Bergen among many. Lubeck also gets big ups for resfusing let Hitler speak there during his 1932 election campaign. He ended up speaking in some place called Bad Schwartau on the outskirts of Lubeck and apparently afterward only ever referred to the Lubeck as "the small city close to Bad Schwartau." Today, the state of Bremen consists of the city of Bremen and about forty minutes down the river Weser, the city of Bremerhaven- so it's technically two separate enclaves. But finally, finally, we can talk about the flag of Bremen! There's not much I can find on the specific meaning of the flag- except that it's known as the Speckflagge, or the Bacon Flag. (Coolest. Flag. Ever.) 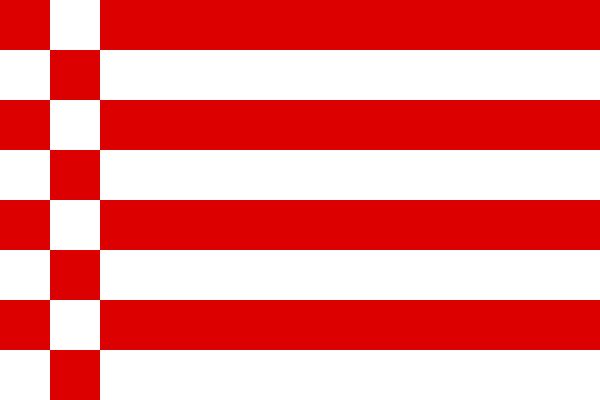 It's got eight equal horizontal stripes of red alternating with white and it's checked at the hoist. There's a couple of other versions as well. The Staatsflagge has eight instead of twelve stripes as is defaced with the Coat of Arms of Bremen. The Dienstflagge der bremischen schiffahrt it's used on state buildings for shipping and navigation as well as the jack on Bremen's ships. I don't know if or when I'll ever get over to Germany, but I think just the sheer amount of history as well as the geographical uniqueness of the area puts Bremen high on my list of places to visit when I do. Plus, it's the Bacon Flag! It can't get any better than that.